This is part two of a two-part special with the Bulletin featuring religion scholars Joseph Blankholm, Donovan Schaefer, Monica Miller and Steven Ramey on the topic of the “Nones.” In part 1, Blankholm and Schaefer respond to a 2013 American Academy of Religion (AAR) panel discussion featuring Miller and Ramey entitled, “Discussing the Nones: What they say about the Category of Religion and American Society,” which was preceded by a Huffington Post piece they co-wrote, “Meaningless Surveys: The Faulty ‘Mathematics’ of the ‘Nones.” Here in part 2, Miller and Ramey offer their replies. This is part of a broader and growing academic discussion on the diversity of non-thiestic belief, featured in the 2014 AAR Call For Papers (now accepting submissions) and is co-sponsored by the Secularisms and Secularity Group, the Sociology of Religion Group, the Religion and Social Sciences Section and the Religious Conversions Group. Engaging with colleagues concerning the AAR panel on the “Nones” is a pleasure. Reading Schaefer’s and Blankholm’s responses to that panel illustrates how our interests, despite addressing the same general topic, within the same field, in these shared scholarly venues, diverge and influence our analysis. While Blankholm, for example, wants to “understand the present restructuring of American religion,” my interest is the ways identifications have come into being. Discussions of the “Nones” demonstrate how our respective analyses do not neutrally describe the world but construct a particular world, and that world sometimes does not remain under our control but enables some to use the labels validated in scholarship for various ends. Our selections of questions and sources reflect these divergent interests. Focusing on media sources more than peer-reviewed materials was a strategy I used to analyze how organizations, activists, and the media have used the discourse surrounding the unaffiliated to refine and maintain a group now labeled the Nones. Similarly, Blankholm’s dismissal of those sources correlates with his interests to develop a more authoritative description of contemporary society. Recognizing that our own interests drive our respective analyses illustrates how we construct, even imagine, the world that we intend to describe. Our selections of which questions to ask on a survey, which responses to highlight, which sources to cite construct an organized world. Characterizing the “Nones” as “an intransigent piece of data that starts to demand attention,” as Schaefer does, naturalizes the imagined category as pre-existing the “discovery” of it. Certainly, people with no religious affiliation exist in the world, and more people now respond to surveys as having no religious affiliation than ever before, but scholars and media were the ones who asked the questions and then selected that question, out of all that were asked, as the basis to define some respondents as comprising a group with commonalities and an ability to act. Returning to my India example, people venerated the Guru Granth Sahib long before the nineteenth century British Indian censuses, but the enumeration and analysis valorized the construction of Sikhs as separate from Hindus, reflecting British assumptions about religion and society. This construction, which some in India used for various purposes, was not neutral but has changed community identifications and legal relationships. The discussion of the unaffiliated intrigues me because it allows us to observe the development of a new category. Some who are labeled Nones, like some labeled Sikhs and Hindus, use the label to construct their own community with a veneer of natural description that eventually reads the group back into history, long before the label was first imagined. So, the construction of the “Nones” contributes to the work of group formation and maintenance, which then becomes cloaked by the dominance of particular discourses. What other labels are we using now that naturalize the process of group formation and maintenance, implying a consistency and commonality that is a byproduct of the construction? Buddhist, Catholic, atheist, secular humanist, along with many others, are imagined identities like the “Nones” that promote a commonality over various differences, cloaked as if the group always existed. The category of the nones is not a joke; The category of the nones is a “not” joke. Whether scholar, journalist, Pew analyst, or whoever, we often end up looking and sounding like Borat when we try to put categories to use. Or, we feel ourselves hopelessly trying to talk to Borat. In either case, we’re stuck in the indeterminate space of translating the “nots” of our editorials and our studies to those who we hope to entertain or inform. A “not” joke “works” because all parties involved are supposed to know whether or not the object of the joke is real. In Borat’s case, it can plead cultural amnesia; what’s our excuses? Although the Nones are a constructed group (and might say more about how scholars, surveyors, analysts, media pundits, journalists and so on go about the business of classification and identification – that is, forming and naming groups, assigning qualities and behaviors, and marketing identities around particular political, social, and cultural interests through techniques such as survey questions) – Blankholm is correct in that it “…is far from a meaningless category.” However, we part ways in terms of the “Now What [do we do with it]?” – Or, to use Blankholm’s language, “So what can we conclude?” Based on findings from the Pew survey, we can conclude that the Nones are not religiously affiliated – and – not not religious or spiritual and not not, for the most part, believers. See the problem here? Indeed the nil creates a monster of a different sort. And while Blankholm is correct that “some pretty interesting things” might come about from such close attention – we part ways regarding what such things of interest might reveal. And that’s just it – for I am not persuaded that the category reveals the type of “change” – the “…present restructuring of American religion” that Blankholm is so interested in examining. From my perspective, the category does not suggest such restructuring to take place, but in my placement of the “not” we see the shifts in vantage point, interest and tools that make Borat so hilarious and conversations like this so productive. How do we study change over time? To what it is applied highlights not so much the “newness” of the change, but the politically interested recasting strategies of what is classified as change and what makes said change new. The Nones are not so new, right? Where is the change? I am with Schaefer when he suggests a turn towards effects – how the category None operates and what gets classified when “we” classify the Nones. If Nones are not religiously affiliated, how does the larger claim that they’re still spiritual and believers, for example, destabilize the common assumptions – scholarly and otherwise – about what religion “is” and what it “does” in the world? What can a “not” joke tell us about how we talk about religion? Blankholm is correct in that the Nones are not new and scholars have indeed played their hand in the construction of the category (Vernon, 1968). Academic and popular discourses both seem to make use of similar techniques and moves in the larger conversation. Perhaps like the “subaltern” – the Nones were only Nones when they weren’t being named. 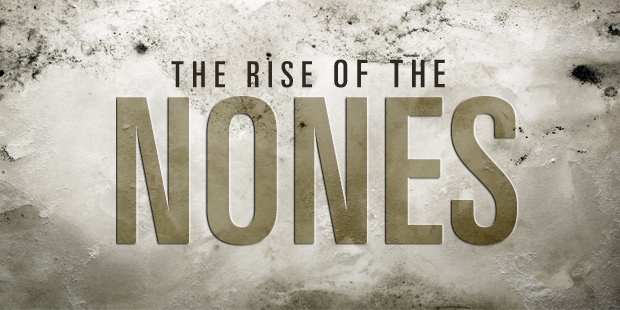 Surely, new Nones not not unlike the old Nones will be discovered and soon on the rise. Many thanks to Joe Blankholm and Donovan Schaefer for the continued engagement and to Matt Sheedy at the Bulletin for the Study of Religion blog for organizing this conversation. Monica R. Miller is Assistant Professor of Religion and Africana Studies at Lehigh University and among other publications, author of Religion and Hip Hop (Routledge, 2012). Miller currently serves as a Senior Research Fellow with The Institute for Humanist Studies (Washington, DC), is Co-Chair and founder of Critical Approaches to the Study of Hip Hop and Religion Group (American Academy of Religion) and is Principal Investigator of a large scale survey project entitled “Remaking Religion,” which examines changing patterns of religion and irreligion in youth culture in Portland, Oregon. Miller is co-author of a forthcoming volume Religion in Hip Hop: Mapping the New Terrain with Dr. Anthony B. Pinn (Bloomsbury Press). Monica also is editing Claiming Identity in the Study of Religion, the first book in the Culture on the Edge book series. This entry was posted in Donovan Schaefer, Politics and Religion, Religion and Society, Religion in the News, Steven Ramey, Theory and Method, Theory in the Real World, Uncategorized and tagged AAR, American Academy of Religion, atheist, Borat, British India, Buddhist, Catholic, Guru Granth Sahib, Hindus, jokes, Joseph Blankholm, Monica Miller, Pew Forum, secular humanist, secularism, secularity, Sikhs, sociology, Sociology of Religion, the Nones. Bookmark the permalink.